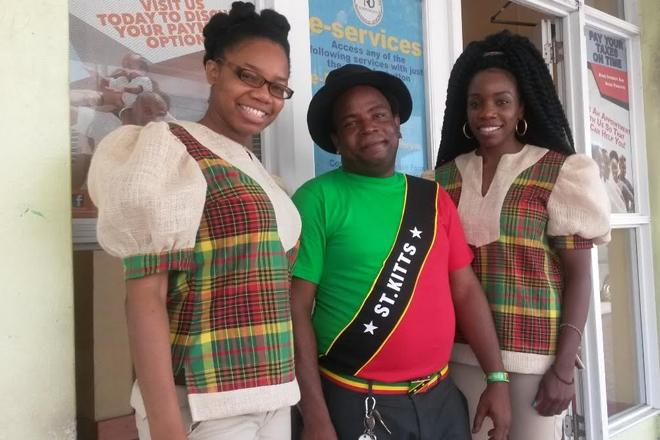 (SKNIS): Residents of St. Kitts and Nevis have embraced Thursday’s commemoration of National Colours Day as many can be seen walking around town dressed in variations of the black, red, green, yellow and white as featured in the national flag. “I feel very good about Independence because it reminds us of where we came from and highlights where we are now,” said Pat, a worker at a local preschool. She was wearing part of the national wear. She added that school has asked parents to outfit their children in the national colours, and it was fitting that she joined in the Independence festivities as she and her family always do. “Most of my family live overseas [but] they fly the flag on their cars and where ever they can put it up,” she said, noting that her relatives can be found in England, Canada, some Caribbean islands and the United States. Pat said the often get together with other nationals living abroad to celebrate Independence, which occurs annually on September 19. Another citizen, Mrs. Cross, said she enjoys this time of the year. Noel Stevens seemingly went all out. He was wearing a St. Kitts and Nevis t-shirt, earrings with the National Flag, a belt with a National Flag buckle and matching socks, and a wrist band featuring the country’s name. “I am representing for our National Heroes who fought to bring us where we are,” he said, noting that he carefully chose his outfit to represent St. Kitts and Nevis from head to toe. Those persons are the Right Excellent Sir Robert Bradshaw, the Right Excellent Sir C. A. Paul Southwell, the Right Excellent Sir Joseph France, the Right Excellent Sir Simeon Daniel and Dr. the Right Excellent and the Right Honourable Sir Kennedy Simmonds. Sir Kennedy was bestowed with the honour last year for his contribution and achievements including being the first Prime Minister of St. Kitts and Nevis. He is the only living National Hero. On Friday, September 16, National Heroes’ Day, the aforementioned nation builders were celebrated with the traditional ceremony at the site of the Proposed National Heroes’ Park on the Kim Collins Highway .